Team Clean and Haul Corporation is the best local choice for dumpster rental in Phoenix, AZ. Team Clean has a reputation for reliability and affordability among Phoenix residents. Team Clean understands the importance of providing outstanding customer service and pricing. If you need roll off dumpster rental in Phoenix AZ for a remodeling project, roof tear off and replacement, yard waste removal, new construction, or house cleanout, contact Team Clean. They’ll show up on time and give you a great price on dumpster rental in Metro Phoenix. Call Team Clean at (623) 748-4923 for roll off dumpster rental in Phoenix, AZ. 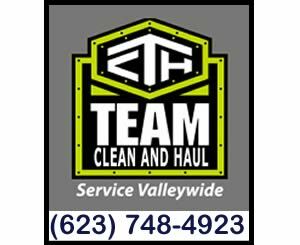 Team Clean and Haul can provide trash dumpsters, waste dumpsters, and construction dumpsters in Phoenix, Arizona. Dumpster service is also available in many suburbs including dumpster rental in Apache Junction, Tempe, Chandler, Mesa, Glendale, Scottsdale and more. Click here to view Team Clean’s entire service area for – Phoenix dumpster rentals. For trash containers or roll off dumpster rental in Phoenix AZ, call (623) 748-4923. Our goal is to make sure that our customers receive the right container at the right!